Bruiser may look fierce, but he is actually very sweet. Bruiser the Shih-Tzu seemed to be slowing down with age. At the age of 13, a routine blood check-up at Aloha Pet and Bird Hospital showed him to be hypercalcemic (elevated calcium levels in the blood). Further tests confirmed him to have a parathroid gland tumor that produced excessive levels of parathyroid hormone, which caused the calcium levels to be high. Surgery removed the abnormal gland, and Bruiser received intravenous calcium for 2 days and then oral calcium supplementation for a few weeks support to prevent dangerous hypocalcemia before his remaining parathyroid glands recovered completely. 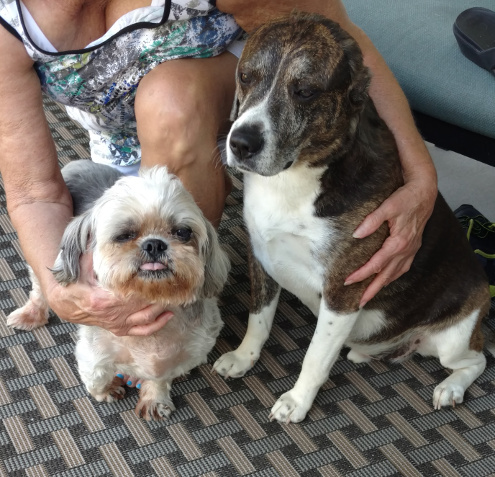 Bruiser's owners were very pleasantly surprised that their little old man was acting like a puppy again. Bruiser the Shih-Tzu seemed to be slowing down with age. When he was 13 years old, a routine blood check-up at Aloha Pet and Bird Hospital showed him to be hypercalcemic (elevated calcium levels in the blood). 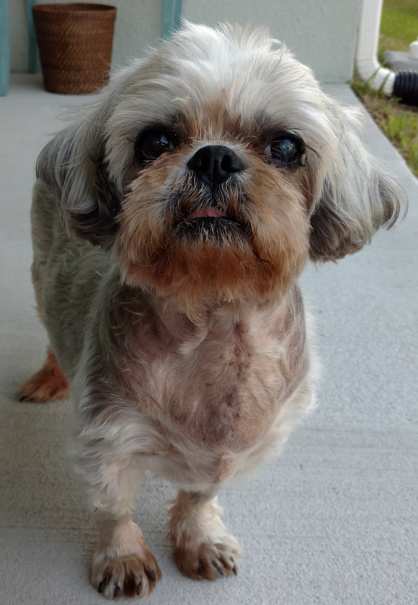 Further bloodwork revealed that Bruiser had an elevated level of parathyroid hormone, and ultrasound of his neck confirmed an 8.8 mm nodule in his left thyroid gland, consistent with a parathyroid tumor. Given Bruiser's age and his generalized weakness, Bruiser's owners were understandably reluctant to put him through surgery. After discussing and considering the matter, and with the information that his weakness could be caused by the elevated calcium, they elected to go forward. A thorough work-up revealed that Bruiser also had calculi (stones) in his bladder; the elevated calcium levels had caused calcium to precipitate out of his urine into his bladder, bond with other ions, and form calculi too large for him to fully void; further, they remained at risk to pass into his urethra and cause life-threatening urinary obstruction. During an approximately 30 minute surgery, the parathyroid tumor was identified and removed with a small margin of normal thyroid to ensure complete removal. As Bruiser was doing very well under anesthesia, the calculi in his bladder were removed as well. Bruiser recovered without complication. As anticipated, Bruiser's remaining normal parathroid glands (there are normally 4 glands) had atrophied (shrunken and become less active) due to suppression from the hypercalcemia. Post-operatively, to prevent life-threatening hypocalcemia (low calcium), we placed him on a calcium infusion and then started oral Vitamin D supplementation we had had compounded for a 19 pound dog. We continued to monitor his calcium levels as we tapered him off of intravenous calcium and switched him to oral calcium carbonate (generic Tums) supplementation. We sent Bruiser home 48 hours post-operatively and continued to monitor his calcium levels as we gradually tapered him off of the Vitamin D and Calcium supplementation. As his glands had been suppressed for at least a few months, it took a few weeks for them to get back up to speed. Bruiser's owners were very pleasantly surprised that their little old man was acting like a puppy again. And Bruiser's "brother," Socks, was happy that he wanted to play again.